Rang Bharani Ekadashi falls in Shukla Paksha of Phagun month and this year it would be celebrated on March 23, 2013. The day of Vasant Panchami marks the beginning of Holi celebrations in Mathura and people of Mathura start their Holi festivities from this day onwards. Celebration of Holi starts in all temples of Radha and Krishna from the day of Vasant Panchami. It is believed that Radha and Krishna played Holi with each other on Rang Bharani Ekadashi. This Ekadashi is also known as Amalaki Ekadashi or Amla Ekadashi in other parts of India. Some people fast on this Ekadashi, while others go for Panch Koshi Parikrama of Vrindavan. 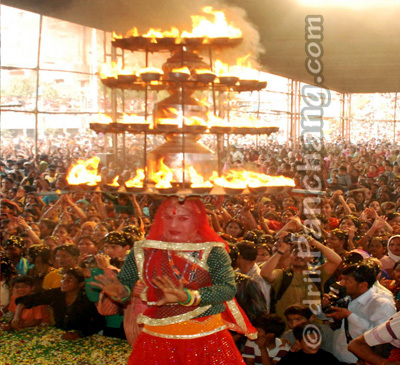 The world famous Lathmar Holi is held on the occasion of Rang Bharani Ekadashi inside Krishna Janmabhoomi premises. The local administration and the tourism department organize special cultural programmes during Holi. Holi which symbolizes divine proximity of beloved Lord Krishna and Radha is replayed at the pious stage of Krishna Janmabhoomi. The sculptures of Radha and Shri Krishna are placed here as if they themselves have come to play Holi. Devotees play Holi with their adorable Krishna and Radha on this pious day. Traditional colors of Holi provide elegance and divinity to the atmosphere which is filled with love and joy. Holi played in different parts of the Braj can be enjoyed here on Rang Bharani Ekadashi. To revitalize Lathmar Holi, tonnes of Gulal, petals of roses and other flowers are arranged which become the main attraction of Holi of Krishna Janmabhoomi compound. 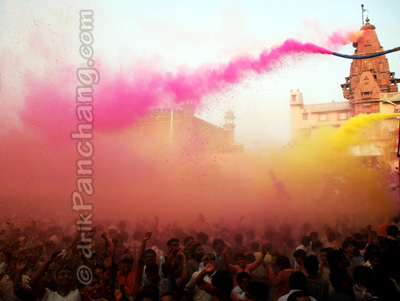 Holi is played with flowers and Gulal which are collected and thrown on each other. This sight of flowers and Gulal along with the echo of Radhe-Radhe reminds one the Dwapar Yuga itself when it was played the first time between Lord Krishna and Radharani. To mesmerize the whole atmosphere drumbeats and traditional Holi songs would be played in the compound. Lathmar Holi is played with timber and shield which revives the ancient tradition of Braj Holi and brings it to life in the modern age. In order to ensure smooth and secure arrangements in Shri Krishna Janmabhoomi, special barricading is done for the occasion. The separate arrangements for seating are done for the men and the women in the sprawling compound. Devotees visiting this Janmabhoomi program are refrained from carrying any electronic item, match box, Gutkha, cell phones and other restricted items inside the Krishna Janmabhoomi compound. 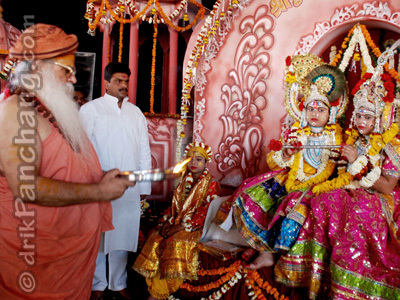 Special programmes would be held at holy stage of Krishna Janmabhoomi. Hurrey and Hurriyani from Radhaji’s birthplace, village Rawal, would exhibit Lathmar Holi. The throne of Krishna and Radha is made such that devotees sitting far off can also sight it easily. The hue of Lathmar Holi is unique. People stand in queue for several hours to get a glimpse of their adorable Krishna and Radha. The various type of clothes, leaves and flowers are used to decorate the stage. The decoration of the stage is done awesomely beautiful.